- Make headlights clean and clear again. - Removes faded hazy look. - Simply rub on and wipe off. - Optical restorer and protectant. - Works on all colors. - No sanding required (but is optional). - Seals and protects against future sun damage. - Blocks harmful UV rays that ruin plastic. Repairing faded headlights can be very expensive. Headlight plastic is sensitive to harsh UV rays, which fades the plastic and turns it from crystal-clear to hazy and opaque. Professionals can charge hundreds of dollars to sand, polish, and re-finish headlight plastics, and replacement units can cost thousands of dollars depending on the car. 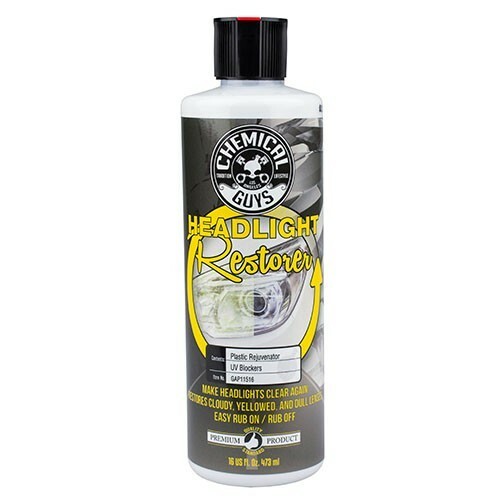 Save yourself the trouble, and simply rub out any hazy headlight residue with Chemical Guys Headlight Restorer and Protectant. 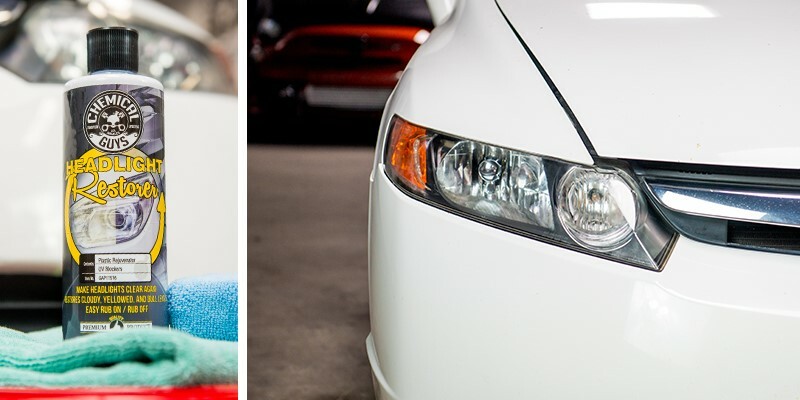 Simply rub the refined cream formula into the faded headlight plastic with a microfiber towel until it turns clear. That’s it! Most plastic turns from hazy and yellow to crystal-clear in seconds with Headlight Restorer and Protectant. Tougher faded plastic can be professionally sanded with 2000 and 3000 grit wet sandpaper, then restored clear with Headlight Restorer and Protectant. 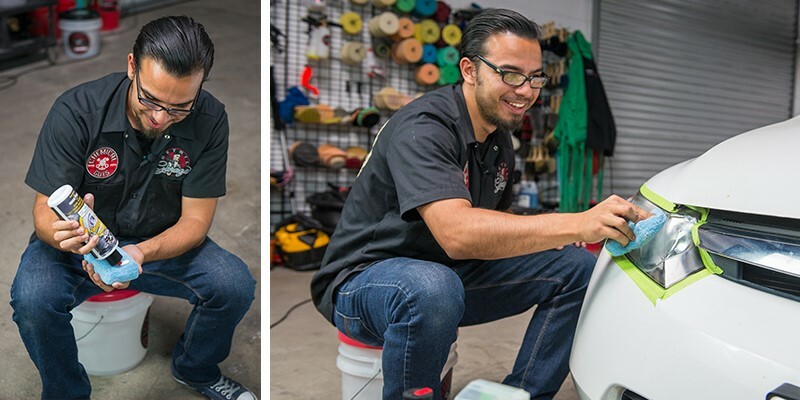 Use Headlight Restorer and Protectant by hand and a microfiber towel, or use it with a machine polishing kit to get 100% professional-level results. Every driver, detailing enthusiast, or professional detailer can make old headlights shine like new with Chemical Guys Headlight Restorer and Protectant. Sunlight damages plastic. Ultraviolet radiation attacks plastic polymer chains, causing a chemical reaction that turns clear plastic into a hazy mess. Headlights, tail lights, turn signals, and other clear plastic lenses on cars are very sensitive to continuous sunlight exposure. Chemical Guys Headlight Restorer and Protectant removes dead and faded plastic to reveal the crystal-clear plastic underneath. Headlight Restorer and Protectant is not just a headlight cleaner; it is an optical restoration product that fixes headlights for good. Micro-abrasives blended into the smooth cream formula peel back layers of dead plastic that block light and dull the pure clarity of the headlamp. Full-synthetic wax sealant bonds into the freshly-polished plastic to block harmful solar rays that weaken and haze plastic over time. With Headlight Restorer and Protectant, any faded and foggy headlight can be restored for optical clarity. Headlight Restorer and Protectant restores headlight delivering optical clarity. 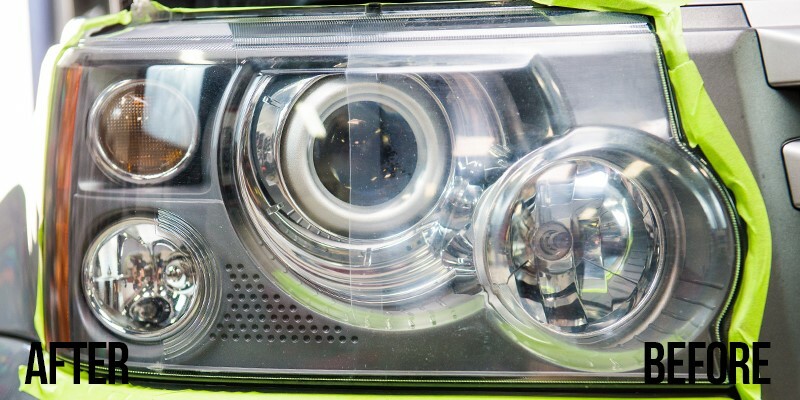 It is the ultimate solution for restoring optical clarity to headlights, tail lights, and other clear plastic lenses around any car, truck, motorcycle, or RV. Low-end headlight solutions simply smear oily tire dressing into faded headlight plastic. Lenses may look clearer for a few days, but the solution rinses out with one rain storm or car wash, and you’re back to square one. Headlight Restorer and Protectant is a professional grade polish that helps remove the faded and oxidized exterior plastic revealing the pure clarity of the undamaged plastic underneath. Easily remove faded yellow and gray crusty plastic to make any plastic headlight, taillight, or turn signal indicator lens look crystal-clear and brand new. Optical-select sealant technology helps protects the sensitive plastic from the damaging UV rays that destroy plastic in the first place, maintaining clear vision for the life of the part. Clear headlight lenses help ensure a safer ride for anyone inside, or outside the vehicle with Chemical Guys Headlight Restorer and Protectant. Spread 3 - 6 dots of Headlight Restorer and Protectant over a microfiber pad or applicator pad. Scrub hazy headlight lens vigorously until the polish turns clearWipe off residue with a clean microfiber towel and inspect work. Repeat until headlight is satisfactorily clear. Sand off stubborn headlight haze with 2500 grit wet sandpaper for professional-level results. Apply 3 - 6 dots of Headlight Restorer and Protectant to a light polishing pad and work over the part on speed. setting 4 - 6 with a Dual Action Polisher, or up to 1800 RPMs on a rotary polisher.